Bringing It All Back Home, Highway 61 Revisited, Blonde On Blonde. Surely, that eighteen-month stretch from the start of 1965 to the middle of 1966 was - and will remain - the most creative and influential period in Dylan's career. During this time he was not only producing ground-breaking works at a phenomenal rate, but also getting them heard by a larger audience than any artist had ever had available before. His influence could be heard everywhere, from The Beatles to The Golden Gate Strings. But it seems that Dylan was moving so fast in this period that his record company could barely keep up with him, and the result was an unparalleled degree of confusion and inconsistency in the production and packaging of his recorded work. I have already written about Blonde On Blonde, the most confused release of all; the album which preceded it, Highway 61 Revisited, comes in a clear second. Like nearly all of Dylan's 1960s albums it has a split personality, divided between the once-definitive mono version and the now almost ubiquitous stereo release. However, unlike Blonde On Blonde, which at the latest count has had three mono, five stereo and one surround mix, Highway 61 Revisited appears only to have one of each, unless you count the fly-on-the-wall, complete 1965-66 sessions release of The Cutting Edge, Collector's Edition. 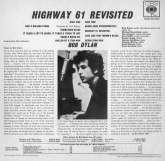 With Highway 61 Revisited, the variation has come in different ways: an occasionally-appearing alternate take, remasterings from different generation tapes, different sleeve designs and content. This article attempts to document the album's history. As with the articles on Blonde On Blonde and Bringing It All Back Home, I make no claims of completeness or total accuracy. Rather, this is intended to be a structured presentation of all the information I can muster at this point in time, based on my own research and listening. I will continue building on this foundation as further information becomes available. If you have any corrections or further information, please do send them to rogerfordxblueyonder.co.uk , replacing the x with an at-sign. 1. I have generally confined discussion to the US and UK issues of the album, with one or two notable exceptions. I am aware that there are countless editions from other countries, some with changes to the sleeve design and occasionally even to the album title. But these alterations are just matters of local marketing policy, and appear to reflect no variation in Dylan's artistic intentions. As far as I am aware there is no further variation in musical content. Alan Fraser's astonishing site Searching For A Gem is the place to explore the myriad variations of physical Dylan releases from around the world. 2. I have also generally ignored releases in different formats such as tape or mini-disc, or alternate mixes and remasterings of individual tracks from Highway 61 Revisited which have appeared on promotional releases or anthologies. Again, Alan's site has much useful information here. 3. Although the number of released alternate mixes of the album is relatively low, I have included in the discussion a couple of tapes of the album's songs which came out of the mixing process and which have circulated widely in tape and bootleg form. I do appreciate that these cannot be judged in the same light as officially released versions of the album, but they fit well into the article and may, I suspect, be of interest to readers. Like Dylan's previous albums, Highway 61 Revisited was recorded entirely at Columbia's Studio A in New York. The first sessions, on June 15 and 16, were produced by Tom Wilson, who had handled all of Dylan's recording sessions over the previous two years. The musicians too were mostly chosen from those who had accompanied Dylan five months earlier on Bringing It All Back Home, but with the key additions of Mike Bloomfield (invited to play) and Al Kooper (invited to watch but ended up playing). While these sessions were apparently booked for Dylan to make a start on his next album, Note it seems as though Dylan's main priority was to record the song which became his next single, "Like A Rolling Stone". Two other tunes were recorded at the June sessions, "Sitting On A Barbed Wire Fence" and an early version of "It Takes A Lot To Laugh, It Takes A Train To Cry"; but they seem to have been little more than warm-ups for the recording of "Like A Rolling Stone". Dylan cannot have been happy with the recordings of either song, as he chose to use "Gates of Eden", a track from his previous album, as the flip side of "Like A Rolling Stone", and the rejected songs from the June sessions only saw official release in 1991 on The Bootleg Series Vols. 1-3. "It Takes A Lot To Laugh" was, of course, substantially re-worked for the Highway 61 Revisited album at the next set of album sessions, six weeks later. Work on the album proper began just after the Newport Folk Festival, on July 29, and continued through until August 4. Bob Johnston replaced Tom Wilson as producer, and some of the ex-Bringing It All Back Home musicians departed. Bloomfield and Kooper were back, and Kooper recruited his friend Harvey Brooks to play bass. Brief appearances were made by bassist Russ Savakus and drummer Sam Lay; Charlie McCoy called in on the last day of recording and played the memorable second guitar part on "Desolation Row"; the previous day the Chambers Brothers had been brought in to try overdubbing gospel-style backing vocals on the refrains of "Tombstone Blues". Note Details of the dates, the musicians and the songs recorded are discussed at much greater length in a series of articles on The Bootleg Series Vol.12: The Cutting Edge 1965-1966. A tape of rough mono mixes from the album sessions has been in circulation since the mid-1970s, and was later bootlegged as Highway 61 Revisited Again. This tape contains the released take of "Like A Rolling Stone" plus one take of each of the songs recorded at the second group of sessions, including "Positively 4th Street" and "Can You Please Crawl Out Your Window". It was apparently sent to Witmark and Sons, most likely for the purpose of registering this new set of songs for copyright, and was probably never intended to reflect the final content or running order of the album. Note It sounds very much a rough mix compared with the released mono album, and the ends of the tracks are not faded properly - most of them just go on until the musicians stop playing, or are abruptly cut. Note The tape was always particularly valued for the fact that it contained an unreleased early take of "Desolation Row" and a rather rough version (Take 5) of "Can You Please Crawl Out Your Window". However, the former was eventually released on The Bootleg Series Vol.7: No Direction Home, and both were on the 18-CD version of The Bootleg Series Vol.12: The Cutting Edge; these were new stereo mixes. The inclusion of the early "Desolation Row" suggests that the rough mono mixes on the Witmark tape were produced and collated before the 4 August remake session which yielded the finished album track. The mono album proper was probably mixed under the direction of Bob Johnston (and possibly Dylan himself) in the week or so following the final recording sessions. Dylan may or may not have been present at the mixing sessions, but he would most surely have listened to the mono mixes carefully before approving them for release. Completed mixes appear to have been compiled on a master reel with the Columbia job number SW 98151. Note Acetates documented as having been derived from this tape were later given to Dylan's friend Emmett Grogan, and recordings of these passed into circulation in the mid-1990s. This set contains all the songs from the July-August sessions, but this time includes the final version of "Desolation Row" as included in the album, and the more polished recording (Take 17) of "Crawl Out Your Window" which was later accidentally released as a single under the title "Positively 4th Street". Note The real "4th Street" is also present, in the mono mix eventually released as a single. The only other surprise is that "Tombstone Blues" has a much longer fade than on the released mono album; otherwise these appear to be the final mono mixes. This SW 98151 compilation may perhaps, therefore, have functioned as the pool of candidate tracks for the album. Note It's interesting that, at least at the time it was transferred to acetate, the set apparently did not include "Like A Rolling Stone"; perhaps this song was not originally intended to go on the album, having already been out for a month or so as a single. However, in the end it was "Crawl Out Your Window" and "Positively 4th Street" that failed to make the final running order, the latter presumably being held back to serve as Dylan's next single. "Like A Rolling Stone" became the album's opener, in the same mono mix as the single. The track was remixed, along with with the other eight songs, for the stereo album. Dylan's involvement in the mixing of the stereo version of the album is very questionable, given its many differences from the mono version. To begin with, the wrong take of "From A Buick 6" was used for the initial US stereo release - surely not a mistake Dylan would have made if he had been involved in the process. The editing of the ends of the tracks is also a lot less tidy on the stereo album. Perhaps whoever made the stereo mix felt they could take some liberties with extended fade-outs given that the stereo version was less likely to be used for radio airplay. See the separate article on mono and stereo records for a more detailed discussion of relevant historical and technical issues. The track-by-track differences between the rough mix and the released mono and stereo mixes are detailed in Part II of this essay, and Appendix B has a table of track lengths for different mixes. The LP was released in the US in early September, in both mono and stereo. Columbia's release card for the album Note shows the 'Ship Date' as Monday August 30, two days after Dylan's concert at the Forest Hills Music Festival, but this was probably just the date for shipping to distributors. Billboard's review of the Forest Hills performance, published at the end of that week, still referred to Dylan's 'forthcoming album', so the album probably appeared in the shops on Monday September 6; back then, Monday was the day of the week for new record releases. In Britain the album also appeared sometime in September, though probably later in the month; here the stereo edition contained the same version of "From A Buick 6" as the mono. The early US stereo version with the alternate take of this song seems to have been pressed in substantial numbers (any copy with a matrix number ending -1A, -1B or -1C apparently contains the alternate take), but over half a century later good copies are hard to find. However, the US was not the only country where the alternate take appeared: it was also to be found on stereo pressings in Canada through to the mid-1970s (matrix numbers ending with -1A), and in Japan it was used for all vinyl issues of the album right through into the 1980s at least. The mono album was deleted in the US in January 1969 (see the release card again) and later in 1969 in the UK; but in some countries - Italy, at least - the mono LP remained in print until the latter half of the 1970s. The stereo LP seems to have stayed in print until the early 2000s in the US, possibly with some patches of unavailability in the 1990s. In Europe it appears to have been discontinued by Sony in the early-to-mid 1990s, eclipsed by then-ubiquitous CD. Highway 61 Revisited was one of the first Dylan albums to be issued on CD, around April 1985. 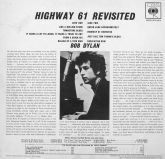 Whereas Bringing It All Back Home and Blonde On Blonde were remixed from the 4-track studio master tapes for their release on CD two years later, the original CD of Highway 61 Revisited was mastered from tapes originally used for cutting stereo LPs. The CD therefore inherited a sound that was severely compromised by the limitations of 1960s stereo vinyl-cutting technology. Bass, in particular, had to be restricted - see the separate article on mono and stereo records. By the early 1990s the audio industry was beginning to realise that while the compact disc was a miraculously noise-free and relatively indestructible medium, the old rule of garbage in, garbage out still applied. If the first tape that came to hand happened to be an nth generation copy of an already compromised cutting master, it was still going to sound bad on CD. The real skill lay in finding the best, most original master tape. Having found the right tapes, Hoffman spent much of the first half of 1992 working on getting the best possible sounding digital transfer; a crucial part of his method was using an original Ampex valve deck to play back the tapes. Despite the fact that this remastering was done before the advent of more advanced 20- and 24-bit digital transfer technologies, the resulting CD has gained universal praise for its sound quality, which I'll discuss further in Part II of this article. The DCC disc has now sadly been out of print for many years, as the licence from Sony was for six years only. Copies sometimes come up for sale, but prices tend to be fairly high. In the UK, the stereo LP was reissued by specialist labels Absolute Analogue (1998) and Simply Vinyl (2000), but these were only licensed for limited periods, and would have been made from CBS UK's cutting master tapes. The next significant reissue of the stereo album came in September 2003, as part of Sony's major Dylan reissue programme using the hybrid SACD format. 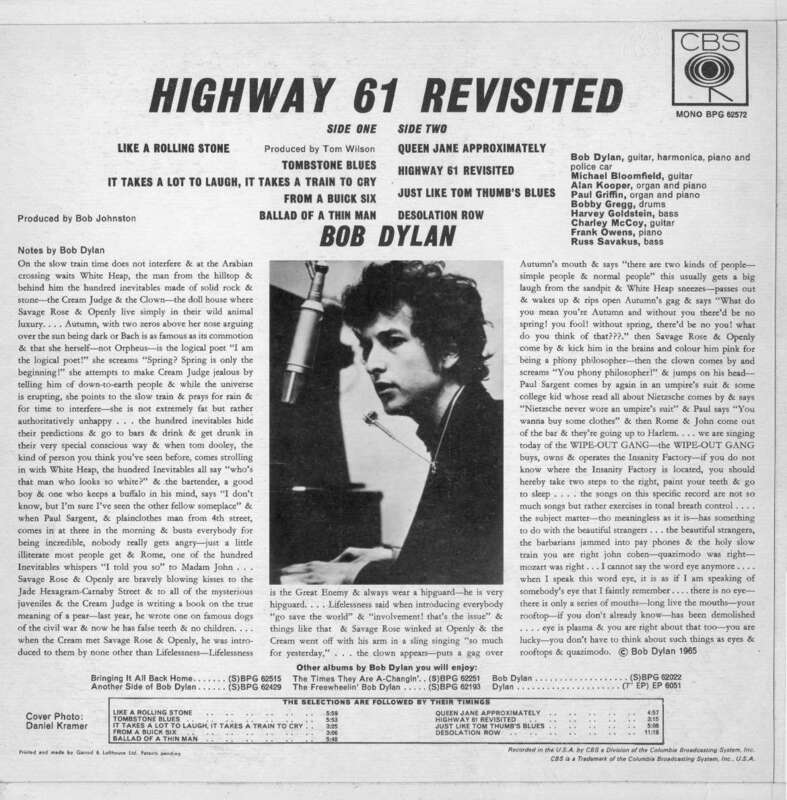 Unlike Bringing It All Back Home and Blonde On Blonde, Highway 61 Revisited was not remixed from the original four-track recordings, and there is no 5.1 surround mix on the SACD. It was only remastered in stereo - this time by Greg Calbi. Although Calbi apparently used the same 1965 "DO NOT USE" stereo mix-down tape as Hoffman had used for the DCC edition, Note the tonal quality is strikingly different; this is discussed further in Part II of this article. Suffice it to say here that most people who have heard the DCC CD seem to find it significantly more enjoyable than later remasterings. The conventional CD layer of Sony's hybrid disc was no doubt mastered using a more sophisticated analogue-to-digital conversion process than was available to Hoffman in 1992, and the SACD layer uses a completely different encoding method. (See the separate article about audio technology for some further explanation of these technicalities.) However, I'm sure the sound was influenced much less by these technological factors than by the engineer's decisions as to how the album ought to sound. Greg Calbi's CD-layer remastering was subsequently also released (in 2004) in standard CD format, at a lower price than the hybrid SACD; this is now the standard edition, the SACD having been deleted some years ago when Sony abandoned the format. In 2001 the US reissues label Sundazed had revived the mono mix under a vinyl-only licensing deal, mastered by Bob Irwin. Then in 2010 Sony released the mono version on CD for the first time, as part of the box set The Original Mono Recordings; here it was mastered by Mark Wilder. There was a corresponding vinyl edition, mastered by engineer George Marino. The tape used was in fact a 1965 copy found in a Sony tape store in Germany, the original US mono master having been lost. Note In Europe, Marino's cut was pressed and released as an individual album by the Dutch company Music on Vinyl. This was re-pressed in 2015 as a Columbia/Legacy release; curiously, aside from the old CL 2389 serial number, there is nothing on the shrink-wrapped sleeve to tell the customer that they are buying a mono album. Over the period 2014-2017 the US audiophile label Mobile Fidelity Sound Lab has released both the mono and stereo album mixes, each in a 45rpm double-disc vinyl edition; and each mix has also been released by MFSL as a remastered hybrid SACD. The stereo album (presumably in Sony's 2003 mastering) is now available online as a high resolution digital download; but the mono mix seems only to be available in compressed format. In 2015 Sony released The Bootleg Series Vol.12: The Cutting Edge 1965-1966. Because the compendious 18-CD Collector's Edition included everything Dylan recorded in the studio in those two years, it necessarily included all the tracks that appeared on Highway 61 Revisited. These were not intended or sequenced as a new version of the album, and the new stereo mixes by Steve Addabbo were in a deliberately unpolished, fly-on-the-wall style; however, they make interesting comparisons with the other released and unreleased mixes, and occasionally shed new light on the production of the released album. Further commentary on this release can be found in a series of articles written for ISIS magazine. The original US mono album is probably the best starting point and standard for the comparison of alternative sleeves. The front cover of this initial release had the title and Daniel Kramer's colour photo centrally placed, with a wide white border all round, while the back had three uncredited monochrome studio shots of Dylan apparently from a series taken at the late July / early August album sessions by Chuck Stewart.Note It also had credits for the musicians, for both Bob Johnston and Tom Wilson as producers, and for Dylan as author of the sleeve notes. At the bottom of the rear sleeve was a box giving the track timings - always something to marvel at on a Dylan LP in those days. Also squeezed in were some useful hints about "Other albums by Bob Dylan you will enjoy". 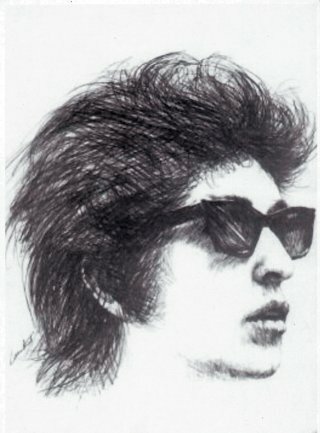 Initial US copies, both mono and stereo, came with a free print, "suitable for framing", of a sketch portrait of Dylan. This also appeared as the frontispiece of the 1965 Bob Dylan Song Book published by Witmark & Sons. Later US stereo pressings from around the mid-70s onward - when there was no need to distinguish them from the deleted mono version and the "360 Sound" tag had been dropped - moved the front picture and title back up to a central position, and for some reason removed the track timing box from the rear sleeve, along with the "Other albums . . ." information. In Europe all sorts of variant sleeves appeared, right from the album's release in 1965. The front sleeve was always similar to the US mono layout, but there the similarities ended. Some countries, Holland included, used the US rear sleeve layout, with the same three photos. France, as usual, went its own way and produced a gatefold sleeve with the transcribed lyrics in English and some short notes in French on the inside; the rear cover had the track listing, the musician credits and two of the three photos from the US rear sleeve, together with adverts for other French Dylan LPs and EPs. Dylan's own sleeve notes did not appear at all, probably being judged neither translatable into French nor intelligible in English. The normal UK sleeve omitted the credits for musicians, production, sleeve notes and cover photo. Some early UK copies, however, in both mono and stereo versions, did include these credits. Why they were subsequently dropped is not clear; possibly it was because they made the layout too cluttered. All variants of the UK sleeve, like the early US editions, contained the track timing details and the "Other albums by Bob Dylan . . ." information. The UK sleeve disappeared when CBS stopped producing vinyl in the UK in the early 1990s; subsequent Sony/Columbia copies were imported from Holland and therefore had the standard US rear sleeve layout. However, the 1998-2000 reissues from Absolute Analogue and Simply Vinyl revived the UK sleeve layout, though without the personnel and other credits. CD editions up until 2003 all used the standardised US version of Dylan's notes, with one or more of the three monochrome photos from the US album sleeve on the back or in the booklet. The DCC gold CD was unusual in reproducing the original US stereo album sleeve, with its 'slipped down' title and photograph on the front. The 2003 reissue on hybrid SACD introduced ten new photographs, mostly by Columbia staff photographer Don Hunstein. The 2004 remastered CD, still in print as the standard edition, inherited these in similar format. The same shots are used in the Mobile Fidelity CD and LP editions, but cropped and laid out differently. In the 2010 Original Mono Recordings box set each album was packaged in a CD-sized paper-on-card replica of the original US mono album sleeve. 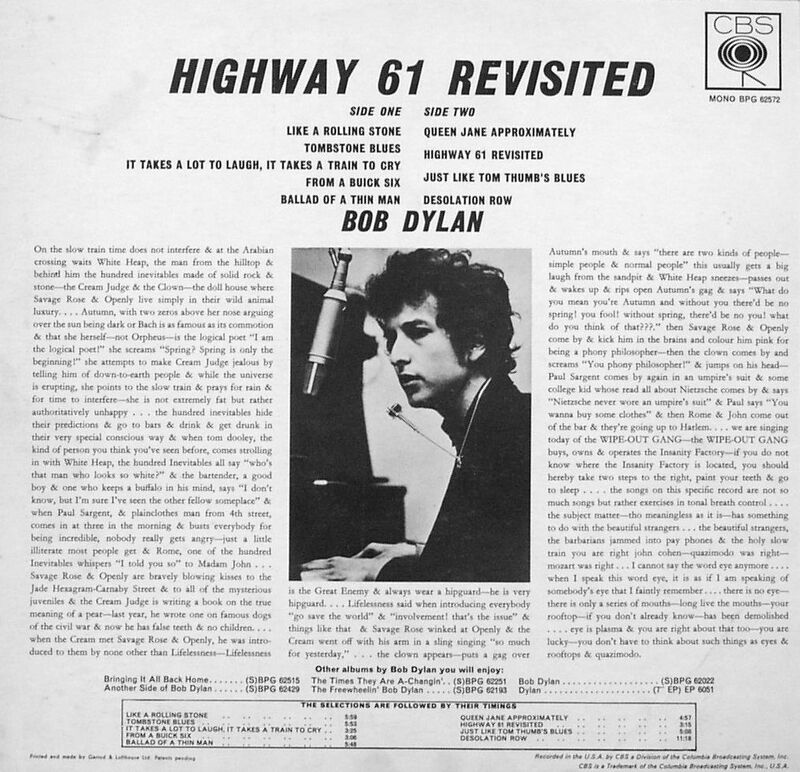 Highway 61 Revisited also contained a scaled-down reproduction of the free portrait print that had been included with early copies of the original album. The mono vinyl reissues (in the box set from Sony and as an individual album from Holland's Music On Vinyl) both came in replicas of the original sleeve, though only the box set edition included the portrait. Part II of this essay looks in detail at the differences between the released versions of the album - and the pre-release tapes - in terms of mixing, editing and overall sound.